died Tuesday, July 17th, in Nye Pointe, Fremont. She was born to Dale and Elsie (Graham) Smith in Nashua, Iowa on September 11, 1926. 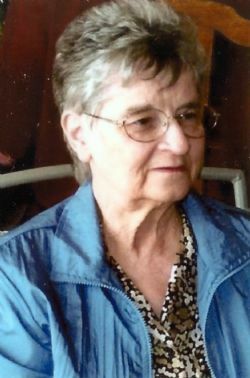 She grew up in the Waterloo, Iowa area graduating from Waterloo West High School in 1946. She attended a business school in Omaha, then worked for Mutual of Omaha until her marriage. On January 27, 1952 Jean was married to Marvin Eggers in Yutan. They lived on a farm near Mead and later near Yutan. While living in that area, they were member of St. John’s Lutheran Church in Yutan. They moved into Fremont in 1992 and managed a motel on west 23rd St.
Jean was preceded in death by her husband Marvin, her sons Randall and Bradley, her sister and 2 brothers. The funeral service will be 10:30 Tuesday (July 24, 2018) at the Ludvigsen Mortuary Chapel, Fremont. The committal will follow in Hollst-Lawn Cemetery near Yutan. Visitation will be 1 hour before the service. Memorials are suggested to St. John’s Lutheran Church in Yutan and Dodge County Humane Society.